It was Edward Wickham’s superlative 1993 recording of Missa Ecce Ancilla with the Clerks’ Group (Proudsound PROU CD 133) that first introduced me to the music of Johannes Ockeghem. They went on to record eleven masses, the Requiem, and half a dozen motets, issued on the Gaudeamus label and boxed up into a 5 CD set which, unfortunately, I’ve not been able to get my hands on. 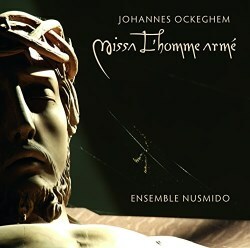 This recording of the composer’s Missa L'homme armé was made in 2014 by the young Ensemble Nusmido – four singers/instrumentalists who specialize in the performance of medieval and Renaissance music from Gregorian Chant to the vocal polyphony of the early 16th century. They are joined for this venture by Miyoko Ito on the fiddle. In the excellent liner notes, to which each of the four makes a contribution, they discuss the strategy behind their performance practice. They position themselves around a large manuscript which is seated on a lectern, and sing from the original medieval notation. Their preference for the original source material is based on their view that ‘it transmits a wealth of information about phrasing that modern notation rarely offers’. The avoidance of bar-lines enables the music to flow more freely. The technique the group employ ‘relies less on a dynamic and affect-orientated characterization and more on a fusion of the voices through the blending of overtones’. Johannes Ockeghem was the most famous composer of the Franco-Flemish School in the last half of the fifteenth century, and many consider him the most influential figure between Dufay and Josquin des Prez. His talents were not only directed at composing but stretched to singing, teaching and fulfilling the role of choirmaster. He held a position as ‘maestro di cappella’ at the French court. He was born in the town of Saint-Ghislain, situated in the French-speaking Belgium province of Hainaut some time between 1410 and 1425, and died on 6 February 1497. Not particularly prolific, some of his work is now lost and some former attributions have been reallocated to other composers. Missa L'homme armé is based upon an eponymous popular fifteenth century song. Other composers who took the song as a basis for their masses include Palestrina, Obrecht, Dufay, Morales and Busnois, whose instrumental piece ‘In hydraulis’ is featured on this release. A setting of the song concludes the CD. Imaginatively, the Ensemble Nusmido have interspersed the movements of the Mass Ordinary with instrumental works that are in some way connected with Ockeghem. Agricola was a younger colleague at the French court. Busnois pays tribute to the composer in ‘In hydraulis’, and ‘Ut heremita solus’ is Ockeghem’s response. The Johanneskirche Halle provides a warm, spacious and sympathetic venue for this unaccompanied vocal music, conferring a sense of shared intimacy and facilitating clarity of polyphonic textures and avoidance of congestion,. There is nothing run-of-the mill here, the Ensemble Nusmido invest these scores with a wealth of imagination and effortless radiance. What I find compelling from these young musicians is their instinctive phrasing, subtle dynamics and immaculate intonation. The instrumental items provide contrast and help sustain interest. This is a most enjoyably release, that would grace any vocal collection.